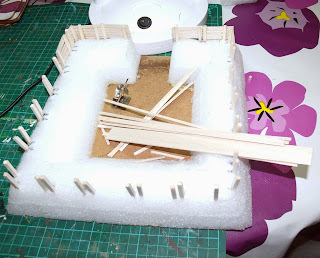 Way back when I built the Sub-Roman watchtower, I said it would be no problem to add some walls. I had forgotten about this. Playing various watchtower games in Dux Brit, it became clear that if you withdraw your force to a watchtower, unless there's some sort of wall, there actually isn't anywhere much to withdraw into. This superb post by Emilio woke me up to the reality of what I needed. 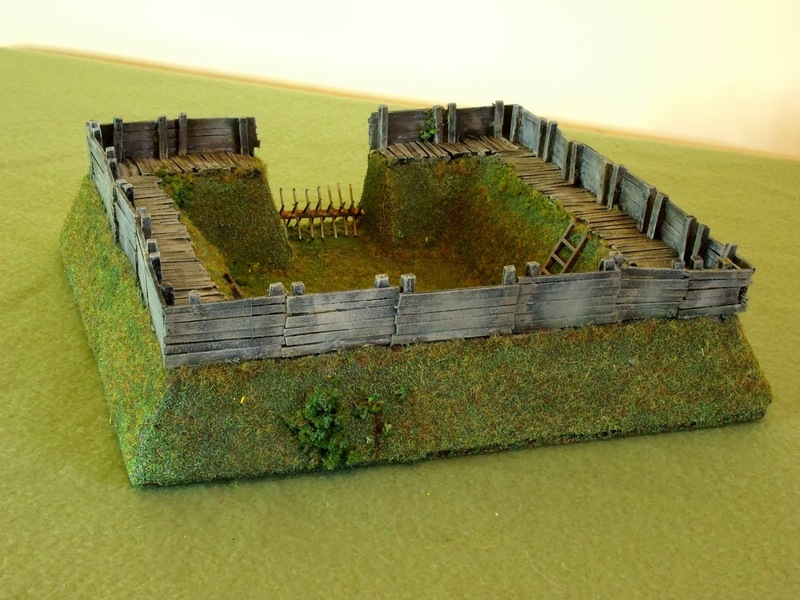 Also, his post shows a nice use of the walls as a standalone enclosure. On the grounds that there's nothing about it to not like, I built one. 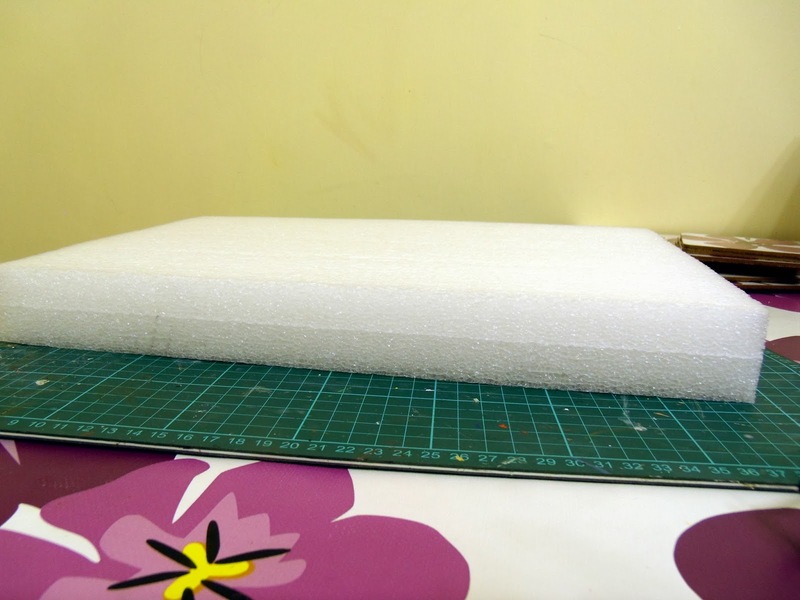 Here's a lump of foam. Very cheap, somewhat cheerful, not really very nasty at all. Never seen a start like this, have you? Not more than several times! And here it is, measured and marked out. The dimensions of the wall are derived (fairly roughly) from the reconstructed turf rampart with a wooden pallisade built at Vindolanda. 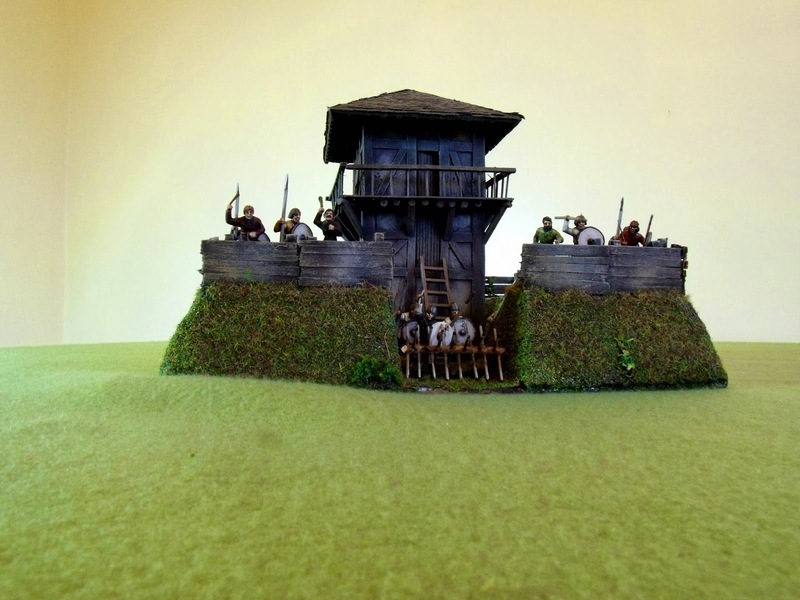 The top of the wall is designed to be wide enough to take a mini on a 20mm base, and for there to be a space wide enough for a mini to stand in between the botton of the rampart and the tower wall. The magic of a Magic Marker! 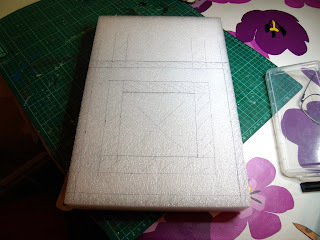 Now, cut out. Turf walls like this are fairly ephemeral. Unless regularly repaired, they will rapidly degrade due to the effects of weather and animal action. What this means is that your structure can be fairly rough and ready, and it will be totally authentic. This one was intended to end up being a reasonably neat version, kept in good repair because the place is under constant threat. The result was, well, you'll see. Next, loads of posts, cut from balsa, get fitted on three sides. 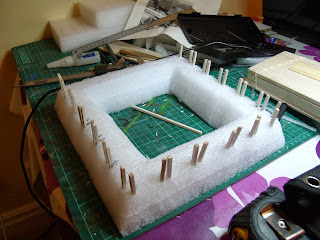 I deliberately didn't cut the entrance at this stage, to make use of the rigidity provided by keeping the structure intact, so I also left the posts off that side. 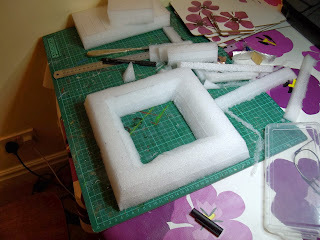 The posts are pushed into pilot holes in the foam and fixed with a drop of CA glue. Think of the archaeology this lot would make! I glued it to a base made of 3mm hardboard (cheap and somewhat nasty) with own-brand impact adhesive (cheap and VERY nasty!). The entranceway is cut wide enough to allow the smaller ox cart I built here to enter (to deliver food, weapons and, most importantly, beer for any garrison). Now before anyone laughs, there's a letter among those found at Vindolanda where a fort commander is pleading with the commissary for beer as his men are becoming deeply restless! At more or less the same time, I added the posts on the gateway side. Base? Check. Gate? Check. What am I missing? Now, here's a thing. On the Gask Ridge, up in Scotland, the Romans built a whole series of little watchtowers/fortlets like this (admittedly several centuries earlier) and several have been excavated. Where the site is well enough preserved for decent archaeology, the remains of the turf walls, banks and ditches and of postholes marking the corners of the tower can all be found. The entrances through the banks and walls are also pretty clear. What none of them seem to have is any evidence of postholes in the entrances, as would be needed to fit any sort of gate. So, onward. 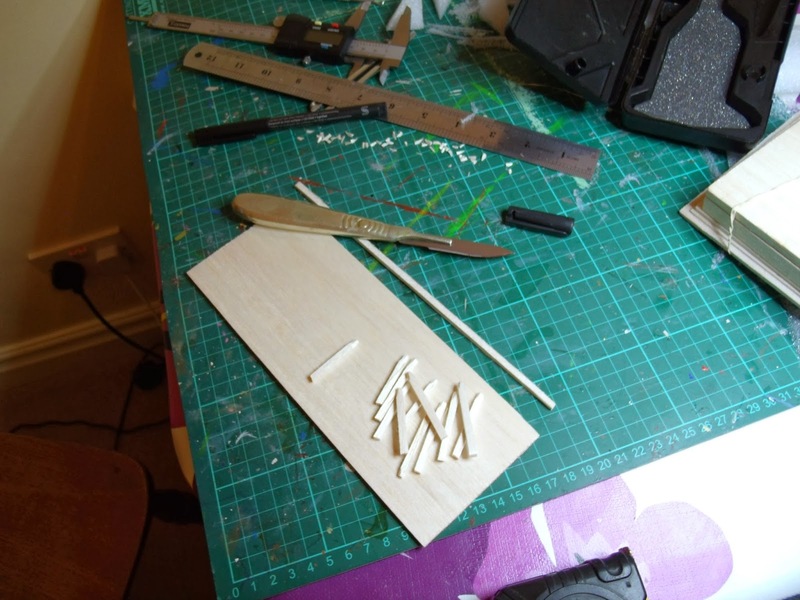 Start cutting a couple of hundred short lengths of balsa, 3-6mm wide. Planks would have been sawn or riven out of whole trunks, in varying widths, and all used. 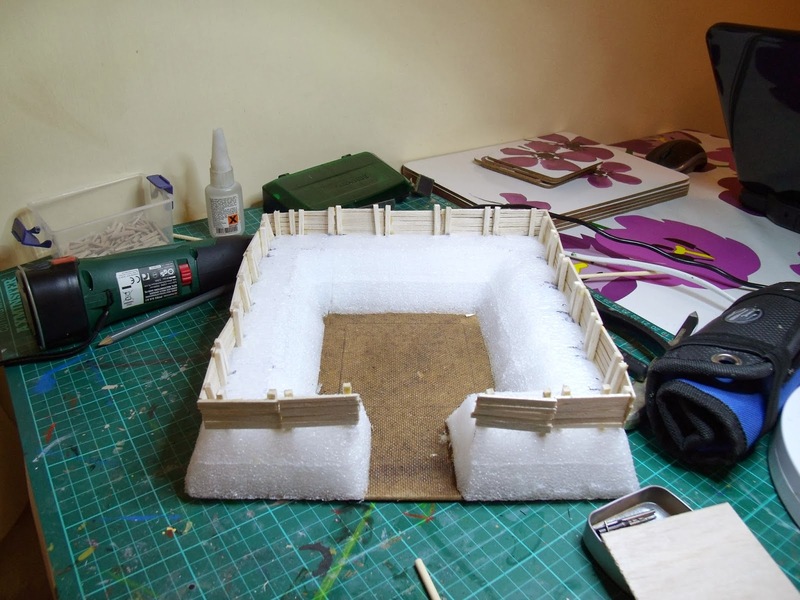 Having eventually planked the whole wall (which only took two evenings...), I gave the woodwork (and then everything else) a coat of PVA to help bind all the wooden pieces together, and provide a key for the rest of the groundwork. Next thing is some details on the ground: basically, turf wall sections are not very resistant to foot traffic, and the areas where people go up onto the walls are going to become a quagmire in no time flat. So, at the bottom of the wooden palisade go loads more short bits of balsa (another really interesting job!) 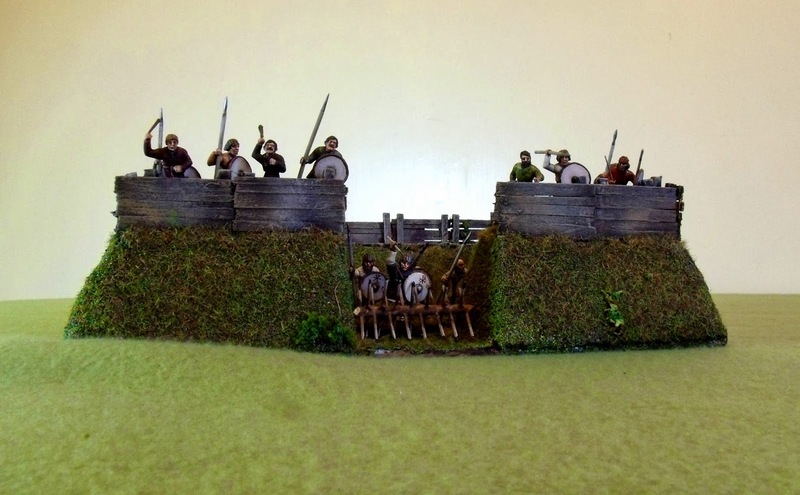 laid on the ground, would prevent the garrison sinking up to their knees at the wrong moment. 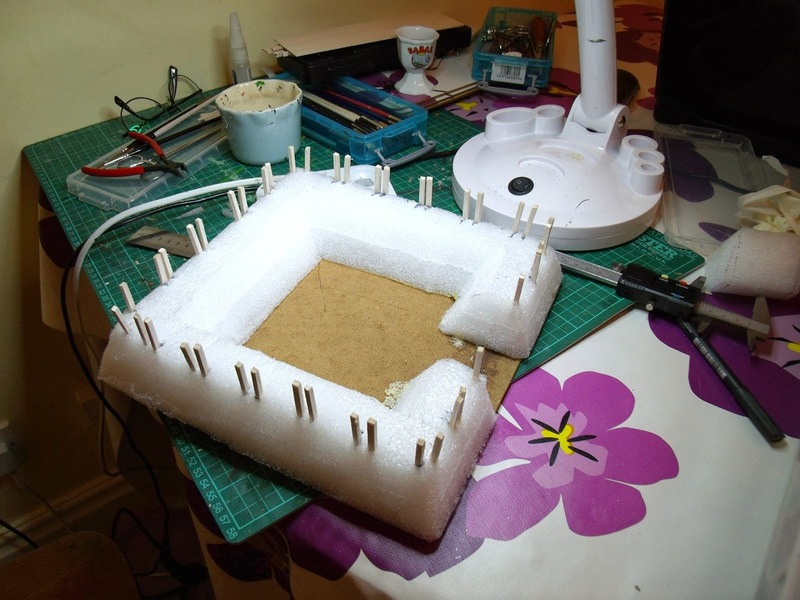 The corners, where planking is difficult, I added some hurdle sections, cast from polymer clay. Making them (mould and item) is covered here. I marked out in the centre for the location of the pre-existing tower, then started a horrible messy task: carefully covering all the foam and wood with a thin layer of painters' caulk. What a grotty job! The stuff gets everywhere. 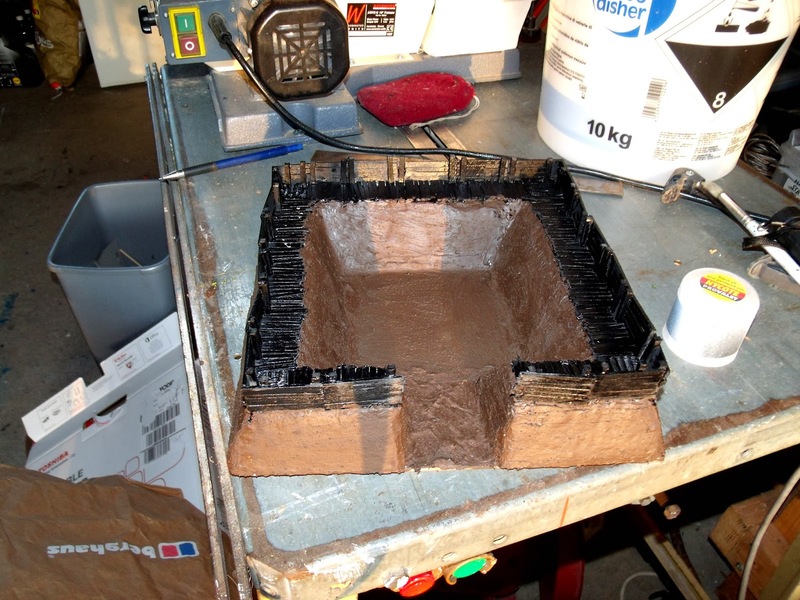 I sprayed all the woodwork black, then went over the groundwork with a mix of brown emulsion, sand and PVA. Here it is ready for colour and details. Walls, walkways, centres. All ready to detail. Flock, dirty washes, drybrushing, clump foliage, more drybrushing, ivy (moss strands and hedgerow mix) and even more drybrushing follows, applied across the whole thing. Nothing you haven't seen before. Static grass completes the appearance. Finally, some accessories. The open gateway is a thing. One possibility is that the defenders made something like a cheval de frise to block the entrance. The basic concept was well known in Roman times, so Sub-Romans could certainly have one. And, of course, once it started to rot, it would have gone straight on the fire and left precisely no archaeological evidence! 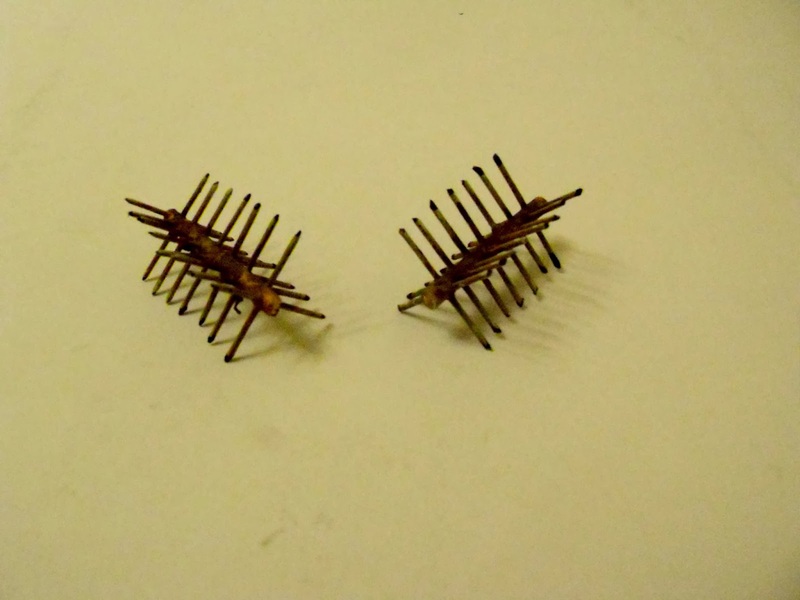 My cheval (chevaux) de frise was made up from bamboo skewer, and an old favourite of mine, headless brad nails. All of these were painted to represent weathered wood, except for the tips of the arms, which were darkened. Whether this represents fire-hardened points, horse muck to promote infection or a subtle combination of both I leave to your imagination. Two chevaux, one for this and a spare for the ECW! Here's the finished article. 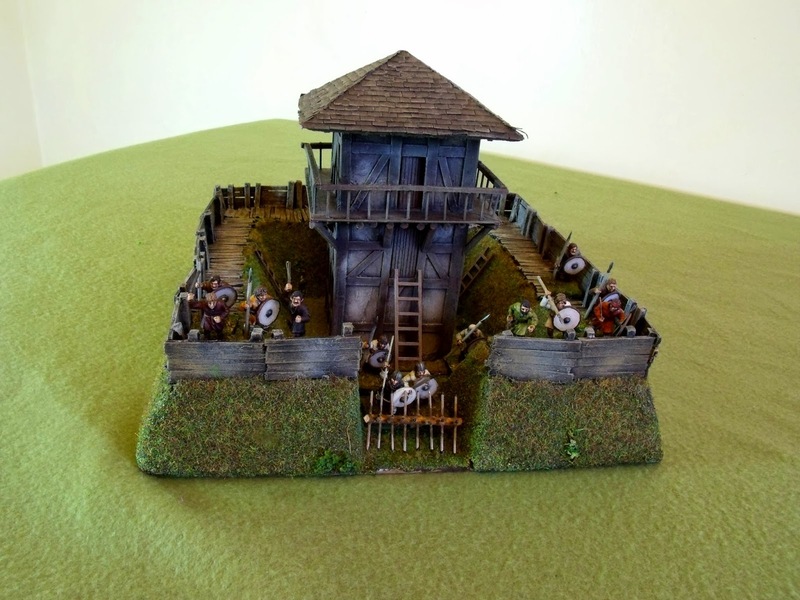 A Warbases ladder got cut down to make two short pieces, which were glued on two sides of the internal bank. It would be a bit steep to climb in a hurry, especially if it's raining (and in England, what are the chances?). 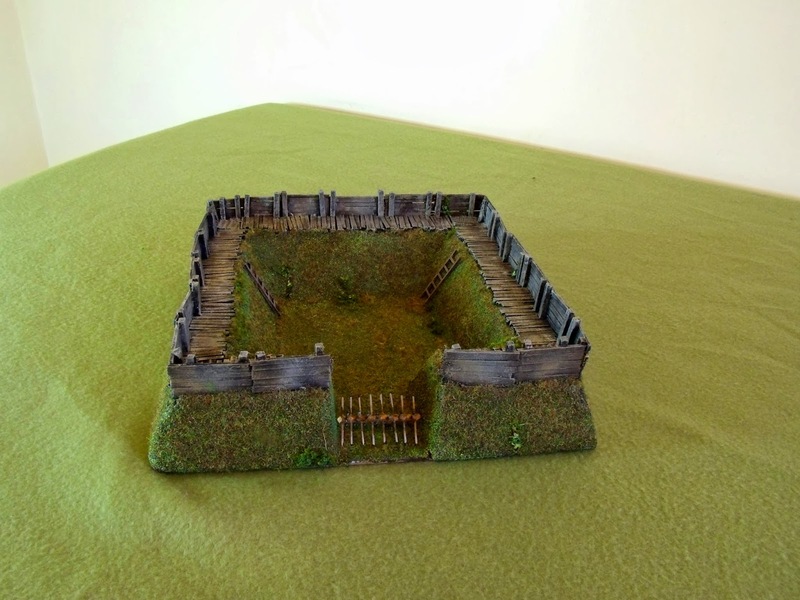 Here's the fortlet, with a garrison. It's a motley collection of levy, warriors, skirmishers and slingers, with one elite companion trying to keep order. Good luck with that. Tough nut to crack, this. Attackers' eye view. Don't fancy it myself. And again, with the tower in place. Looking down into the fort. And another attackers' view. Like this one even less. Looks great. Curious where you sourced your hard board. are they place mats and coasters? Wiatrog, that was the back of an old chest of drawers or wardrobe, as I recall. We replaced a load of furniture, and I made use of some of it - that as a base for a building, and a couple of old formica-coated wardrobe doors to make a nice smooth new top for one of my workbenches! Brilliant piece, and very inspiring. 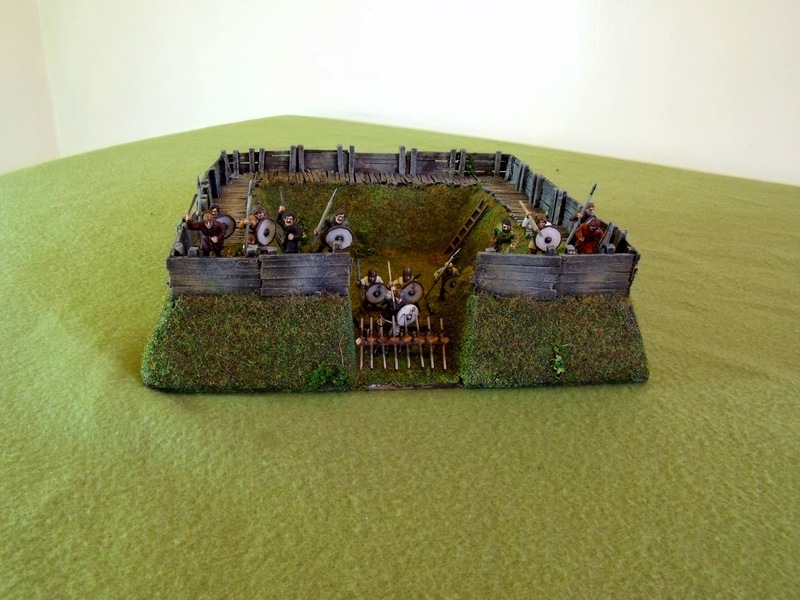 Should be a simple enough task to either scale this down for 15mm, or build it this size as a "real" motte and bailey. Look forward to seeing yours finished!